It had to be one of the best shows this reviewer had the good fortune to witness. 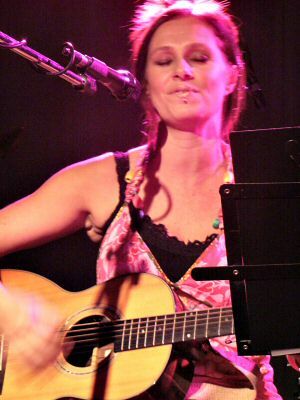 The occasion was a short concert at the Corner Hotel featuring Kasey Chambers and Shane Nicholson performing a preview of their forthcoming joint CD Rattlin' Bones. 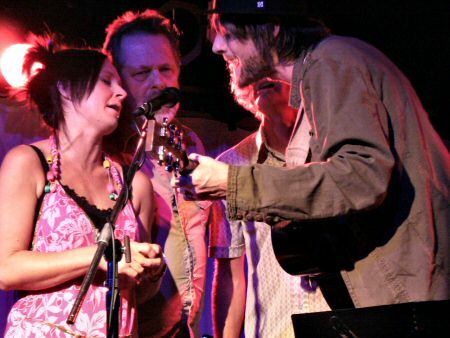 Husband and wife duo, Shane Nicholson and Kasey Chambers have diverse musical tastes. Kasey is well known as a country singer and Shane's music has always been more towards the rock n roll end of the spectrum. Rattlin' Bones transforms this diversity into something new and exciting, eliciting comparisons to Buddy and Julie Miller, Gillian Welch and Gram Parsons and Emmylou Harris. It was obvious, after hearing the whole CD performed live, that they have created a superb album. It is comprised of original songs either composed in partnership or individually. Last night, they had an impressive group of musicians forming a backing band. The instrumentation was acoustic with Mark (Bucky) Collins on banjo, James Gillard (The Flood) on string bass, Bill Chambers on dobro, pedal steel and guitar, and drummer John Watson. The sound was rich and full bodied. Kasey, as well as playing guitar, rattled a tambourine and Shane played a variety of guitars, banjo and harmonica. 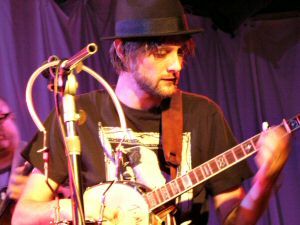 The band swapped around their instruments at intervals and Kasey explained that this process was part of the making of the new record which was recorded at Jimmy Barnes Freight Train Studios in Sydney. As they worked their way through the album in order Kasey delivered a between song commentary on how the songs came to be written, who wrote them and in some cases, where. We learned that Shane is solely responsible for the quirky Monkey on a Wire, the fabulous One More Year and the rambunctious Jackson Hole, which Shane confessed was inspired by a television show. Kasey's compositions were more in the country vein, such as The Devil's Inside My Head. Kasey's down to earth and friendly stage patter had she and Shane engaged in light hearted repartee during the song breaks. Shane appeared to be enjoying himself enormously and was more relaxed and amusing than I had previously seen him in his solo concerts. His mockery of country music led to some comic retorts, such as his scorn for Tamworth, saying that he was forced to write a song there as the offerings in that town were atrocious (he actually was ruder than that). He also, in the process of tuning the banjo quipped that he wasn't a master of it yet as he still had all his teeth. Kasey of course has a lovely singing voice, effortlessly crystal clear and Shane himself is a very fine singer. The two of their voices in harmony sounded made for each other. For the gospel tinged No One Hurts Up Here, Kasey, Bill, James and Shane gathered around the one microphone for a group harmony sing along. One couldn't really single out a highlight, but for this reviewer One More Year is the one I remember as a standout. They performed the entire 14 tracks of the new CD in order from start to finish. It was a glorious foretaste of what to expect from Rattlin' Bones and everyone in the crowd last night will doubtless purchase the CD. It is due for release on 19 April 2008. Hopefully we can expect a DVD in due course as I noticed someone filming the show, obviously in an official capacity. The night ended with a lovely version of Leonard Cohen's Halleluiah as an encore.